Neuroimaging isn’t just about pretty pictures anymore. Microscopists and other imaging scientists are now looking beyond mere anatomy, gleaning vital information about in vivo brain activity from their digital films. They can see where blood flow speeds up, when nerves fire, and what genes are switched on in a cell—all, crucially, without resorting to slicing up the brain. In the 21st-century neuroimaging lab, mice are running around with lightweight microscopes mounted to their craniums. Scientists are using advanced techniques that rely on natural contrast instead of fluorescent markers. They are revamping an old method, ultrasound, to obtain detailed images of brain blood flow. Furthermore, researchers are combining molecular tools with standard imaging modes in new ways to track cells’ behavior, scalpel-free. Driving the development of this new technology is a fact that has long stymied scientists wanting to study the living brain: the darned skull gets in the way. Even if researchers cut a window into the skull, it’s difficult to see past the brain’s surface, so scientists know plenty about the outer cortex but less about the rest of the organ, says Bojana Stefanovic, an imaging scientist at the Sunnybrook Research Institute in Toronto. But understanding how conditions such as brain tumors or Alzheimer’s disease arise requires a deeper perspective. The new methods allow users to look centimeters deep—enough to reach the even the center of small animal brains.This wave of minimally invasive methods also enables repeated imaging sessions over days or weeks, and even permits an animal to move around while the shutter is clicking. The marriage of tried-and-true techniques—light microscopy with ultrasound; molecular biology with magnetic resonance imaging—augmented by a wealth of available probes has researchers observing things they’ve never seen before. But each technique has its own limitations, too, necessitating careful selection. Here, The Scientist profiles the pluses and minuses of five modern methods for peeking into the living brain. Three-dimensional power Doppler micro-ultrasound image of blood vessels in a section of the cerebral cortex of a rat. The image gives detailed information on the location of blood vessels and the amount of blood flowing in each region of the brain. The region imaged is 9 mm wide; the vessels penetrating the cortex (outermost cortex at top of image) are about 2 mm long and have a diameter of approximately 100 micrometers. Ultrasound is a time-tested imaging method, but has received little attention from neuroscientists due to the scattering effects of the skull, Stefanovic says. But by thinning or removing part of the cranium, researchers can get real-time data with sound waves. Stefanovic and her colleagues have used the method to examine cerebral blood-flow volume in response to a mild foot shock (Neuro­Image, 58:100-08, 2011). “This is definitely not the ultrasound that pregnant women will look at,” Stefanovic says. With a higher frequency of sound echoing off of tissues, scientists can observe structures much smaller than a developing fetus, such as blood cells. To improve contrast, researchers may inject animals with gas-filled lipid microbubbles. These rapidly distribute throughout the circulatory system and serve as markers for blood speed and volume. The body quickly clears the bubbles, so there are no lasting effects. • For researchers who are already making a cranial window for optical imaging, it’s easy to add ultrasound, Stefanovic says. • With real-time imaging, scientists can use ultrasound to guide the placement of equipment, such as needles. • A cranial window sealed with glass will reflect sound waves. Even a more permeable substance, such as mylar, will block 30% of the signal. • The mylar covering also produces image artifacts. Stefanovic uses an ultrasound system from VisualSonics Inc. of Toronto. Such equipment starts at $250,000. In photoacoustics, imagers send optical light in, but collect the sound waves that bounce back out. Why sound instead of light? “Photons can scatter thousands of times in the body,” says Roger Zemp, a professor at the University of Alberta in Edmonton, Canada. “To try to make a good picture of anything below, say, a quarter of a millimeter into tissue is very challenging.” Sound waves travel further with less scattering, allowing the signal to cross a mouse skull with a greater depth of focus. Biologists have been using p­hotoacoustic imaging since the 1980s, but its application to the brain—where it allows neuroscientists to observe hemoglobin flow—only emerged in the last decade and is still a maturing field. Zemp uses a 1200-nm laser, sending short pulses of light into the tissue. When that light hits a molecule called a chromophore—hemoglobin, for example—it raises the temperature by a tiny bit, on the order of a thousandth of a degree. The warmed-up molecules expand, and in so doing, produce a tiny “pop.” Ultrasound sensors detect that “pop” and build a picture. 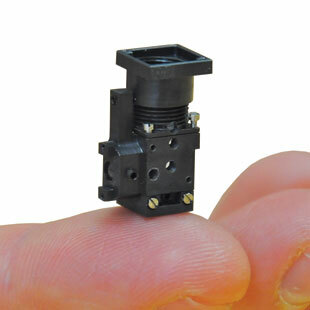 Depends on the depth: 0.5 mm resolution at 5 cm deep, but 1 µm resolution at just 1 mm deep. • No cranial window is required for mice, because their skulls are thin. • Hemoglobin is already a chromophore, so labeling is unnecessary. • Both deoxygenated and oxygenated hemoglobin show up (unlike in functional MRI), and can be distinguished. • Bone and air passages can block the light and sound waves. • The method’s depth is still limited by the penetration of light on the way in. Zemp uses a laser (approximately $100,000) plus an ultrasound system from VeraSonics, Inc., of Redmond, Washington, which costs between $100,000–200,000, he says. Many live-brain light microscope techniques require the subject’s head to remain still. While that restriction can simplify complex responses, it limits the behaviors that neuroscientists can study. Older head-mounted microscopes required stiff fiber-optic cables that prevented full range of motion. To get around that problem, a team of physicists and engineers at Stanford University has put together a featherweight light microscope that can be affixed atop a mouse’s head (Nat Methods, doi: 10.1038/nmeth.1694, 2011). The researchers, led by HHMI investigator Mark Schnitzer, used the device to observe blood flow and capillary diameter. The scientists build the tiny fluorescence microscope out of inexpensive, readily available electronics parts and glue it over a cranial window in the mouse’s skull. The animal is connected to a computer via fine, flexible wires, but can still move normally around its cage. If the researchers want to image beyond the brain’s surface, they insert a thin glass guide tube into the organ, first removing a cylinder of tissue by needle aspiration, so they can place a microendoscope near the structures they want to see. • During imaging no anesthesia is required, and the animals behave normally. 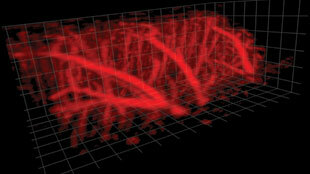 • With 100 frames per second, researchers can track rapid events such as neuron firing. • The microscope only offers 2-D.
• Can only image one color, precluding colocalization studies. The team assembles these devices with cheap, commercially available light-emitting diodes, lenses, filters, mirrors, and a circuit board. The light source and sensor cost $10 or less. Conventional microscopy techniques rely on fluorescent markers, which show up when hit with the right wavelength of light. Stefan Witte and Marie Louise Groot at Free University in Amsterdam, the Netherlands, eliminated that requirement with third-harmonic generation microscopy, in which natural tissues provide contrast. Using the technique in mice, they were able to observe neurons, track blood flow, and aim a pipette for patch-clamp studies of cellular currents (PNAS, 108:5970-75, 2011). Standard lasers cause electrons to vibrate. But the infrared, 1,200-nm, femtosecond pulses used by Witte cause such violent electron motion that the electrons emit light—at 400nm, in the visible range—even if the molecules are not naturally fluorescent. The patterns of emitted light waves vary, depending on tissue consistency, producing contrast where two different tissues meet. The structure of the brain, because of its varied consistencies, makes it a good fit for third-harmonic microscopy, Witte says. The technique is sensitive to hemoglobin and lipids; researchers can observe brain tumors and neurodegenerative lesions in addition to healthy neurons. • Can image unlabeled tissues. • The technique is less phototoxic than fluorescence microscopy, because the electrons only vibrate, but do not become unpaired and cause the atoms to become reactive. • Since the incoming infrared laser is invisible to the human eye, and most microscopes are optimized for visible wavelengths, it can be difficult to focus the beam. • Aside from the nucleus, which shows up as a big dark spot, it’s not possible to see specific intracellular structures. Witte uses a titanium-sapphire laser from Coherent, Inc., of Santa Clara, California. He had LaVision Biotec of Bielefeld, Germany, custom link the laser and a fluorescence microscope, at an estimated total cost of $300,000–400,000. To add functional output to anatomical MRI, researchers at Massachusetts General Hospital are working on a method to “see” gene expression in living animals. The team, led by biologist Philip Liu, has invented a method similar to FISH—fluorescence in situ hybridization—but replaced the fluorescent labels with magnetic ones and the “in situ” with “in vivo” (Methods Mol Biol, 711:363-77, 2011). They have already used several different RNA probes to examine transcription in living animals. Superparamagnetic iron oxide nanoparticles (SPIONs) show up as dark spots on a high-powered MRI. To send the particles to the desired locations, the researchers attach them to antisense oligonucleotides. Cells take up the complex, which finds and binds its target RNA. The cell disposes of any unhybridized probe. The MR signal lasts for several hours. After a few days, once the probe has fully washed out, the researchers can test another probe for a different RNA. • The protocol works at a low dose of oligo­nucleotide, so it does not knock down expression of the target gene—unless that effect is desired. • The imaging is noninvasive, although it’s necessary to inject the markers into the cranium or spinal cord. • It’s difficult to obtain quantitative data, Liu says, because the probe’s distribution is often heterogeneous. 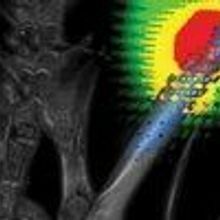 • High-field imaging can cause artifacts, particularly where two different tissues interface. 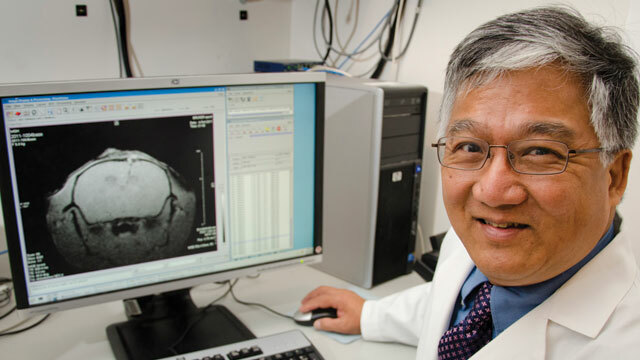 Liu prefers a high-field, small animal MRI machine. The SPIONs are available from BioPAL, Inc., of Worcester, Massachusetts. One $275 vial is sufficient to image 20,000 mice, Liu says.